Posted December 21, 2011 by Josette Farrell in News. Bookmakers Paddy Power could pay out over €7,000 to punters who have backed The Saw Doctors in their bid for the Christmas No.1, if the Tuam group make it to the top of the charts this Friday. According to Paddy Power, spokesperson Sharon McHugh. The Saw Doctors were once as low as 5/2 in the betting, but increased interest in X Factor winners Little Mix to reach the top spot plus campaigns for the #twittermmassingle and Damo and Ivor’s ‘Thank God it’s Christmas’, saw their odds drift to as high as 16/1. However, since their single was officially released they ha e stabilised at 12/1. “There are a lot of people who think they could do it and bets have ranged from €40 to €400. If they did get to No.1, Paddy Power would pay out over €7,000 to punters who got behind them being No.1,” said Ms. McHugh. The Saw Doctors recording of Petula Clark’s ‘Downtown’ was at No.2 in the Mid Week Irish Charts on Monday, which take account of both downloads and CD sales. Little Mix’s version of Damien Rice’s song ‘Cannonball’ was in first place and Coldplay’s ‘Paradise’ was in third. The Christmas No.1 will be announced this Friday, 23rd December, and tomorrow is the last day for sales that count towards the Christmas chart. A large online campaign has built up around The Saw Doctors’ bid for Christmas No.1, with over 74,000 people viewing the ‘Downtown’ video on YouTube over the past month. “There is a great grá for The Saw Doctors in Galway and County Galway and there hasn’t been an Irish Christmas No.1, I think, for five or six years. I think it’s been all X Factor for the last couple of years, so there’s tremendous goodwill towards The Saw Doctors and towards anybody but X Factor,” he said. 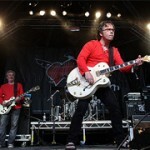 The Saw Doctors will perform ‘Downtown’ live on The Ray Foley Show on Today FM tomorrow, Thursday 22nd December. ‘Downtown’ featuring Petula Clark is available from iTunes for 99 cent and limited editions CDs are also available.